Well, it was great to take a week off and the weather sure was nice in Colorado! It seems like it was a poor week to miss in regards to crop happenings, though. 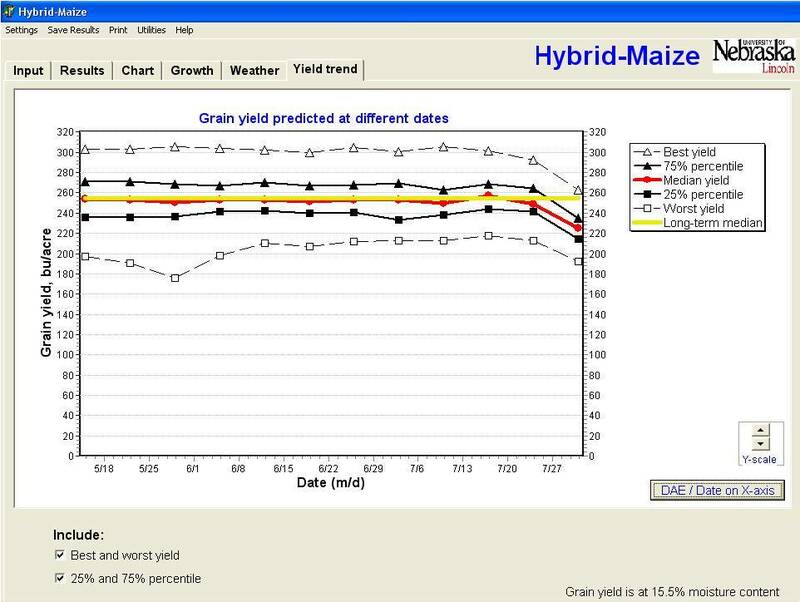 Several of you have been asking for a month now for me to run the Hybrid-Maize model for 2011 corn yield predictions and I just haven’t taken the time to relearn how to input the current weather file and run the simulations-but I did tonight. 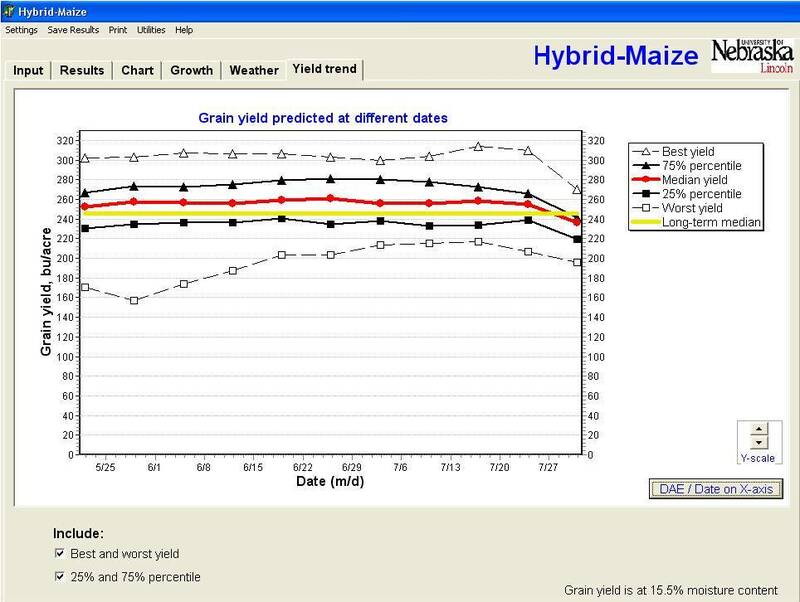 In my May 1 post, I was showing impact of planting date on yield- essentially we weren’t seeing much based on the models. At the time I showed potential yield results of: 113 day hybrid planted April 15 vs. May 1 vs. May 10, the frost risk increased from 10%, 17%, and 21% respectively with average yields in a “perfect year-no limiting conditions” of 248, 254, and 244 bu/acre respectively. For a 110 day hybrid planted the same days, yields ranged from 233, 242, and 243 bu/acre respectively with frost risks of 3%, 10%, and 17% respectively. Granted this is just a model and can’t predict perfectly what will happen. Again, I’ll repeat it’s just a model and is looking at “a perfect year with no limiting conditions”. I already knew we wouldn’t be looking at record yields. The corn had looked even and good for the most part once it got taller, but it hid the many problems including stand problems from rain washing, residue, Pythium, greensnap, etc. Looking at the actual weather data (from Clay Center, NE station), night time temperatures were really high and may have led to the sharp predicted drop off in yields. I remember well the one hot, dry, non-humid week in August 2010. 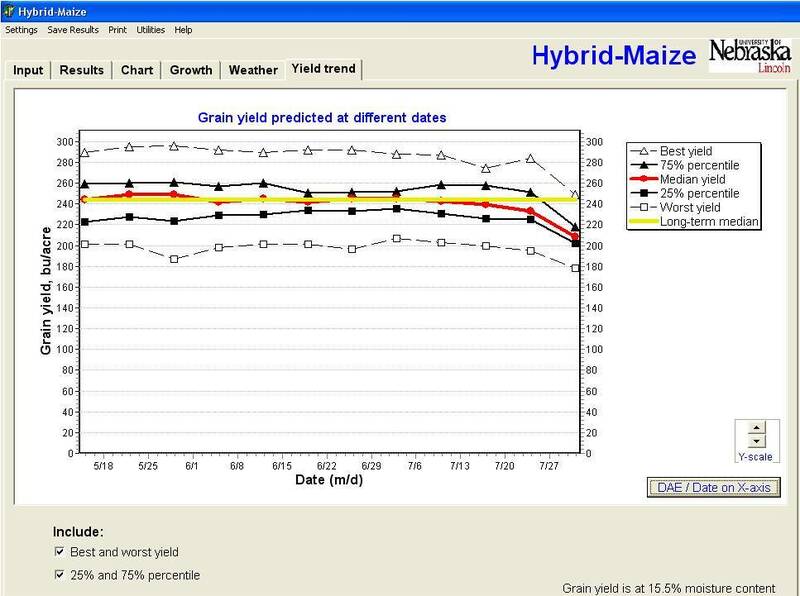 The model showed a sharp yield reduction then and the corn essentially shut down after that. I hope it doesn’t shut down after last week. The other caveat is that I used “generic” hybrids, did not input specific GDD’s or silking dates, and a planting population of 32,000 plants/acre. 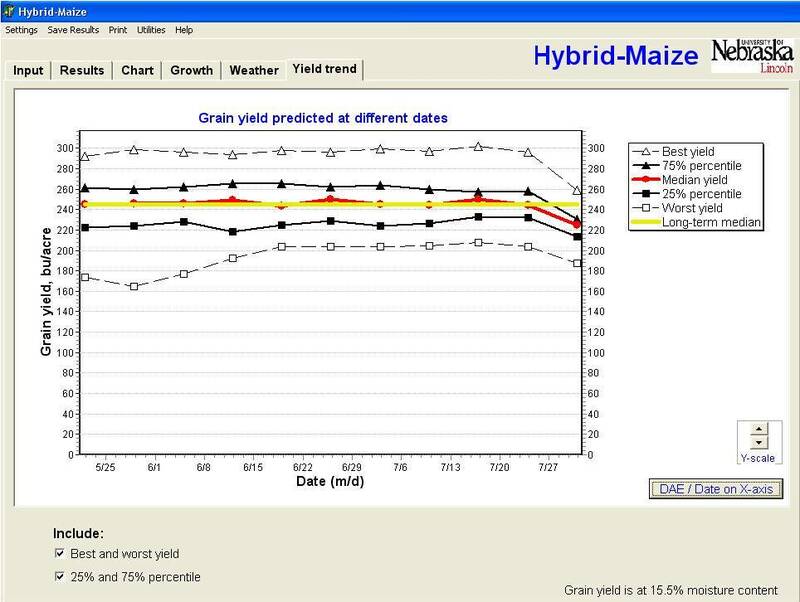 Changing any or all of these factors can influence what the model predicts for yield. Prior to last week, the average yield for 2011 based on Clay Center weather data was tracking at or slightly above the long term 30 year average yields which were similar to the predicted yields I listed above when I ran the simulations for planting dates. 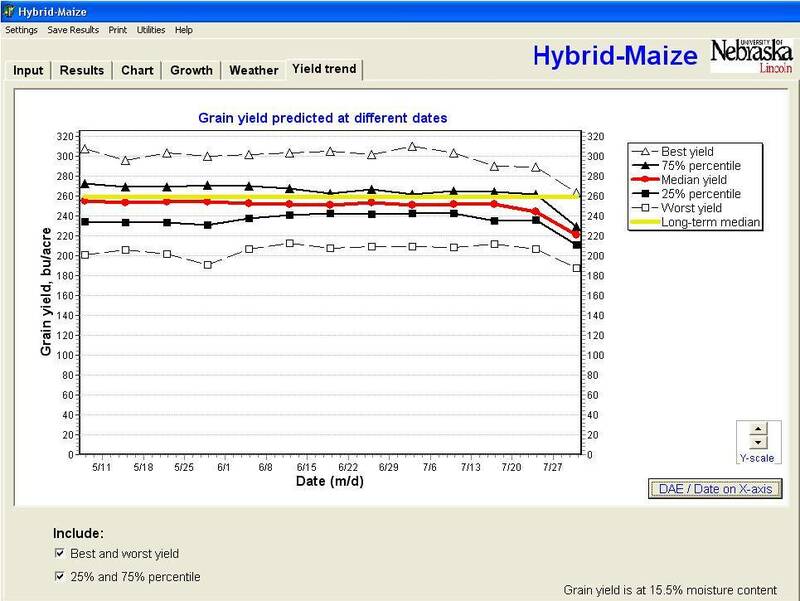 For the 2011 season, a 113 day hybrid planted April 15 vs. May 1 vs. May 10 based on in-season weather conditions at this point may yield 221, 225, and 236 bu/acre respectively. A 110 day hybrid planted the same days based on in-season weather conditions at this point may yield 214, 208, and 225 bu/acre. I don’t mean to get anyone bummed about this year’s crop-again, this is just a model! 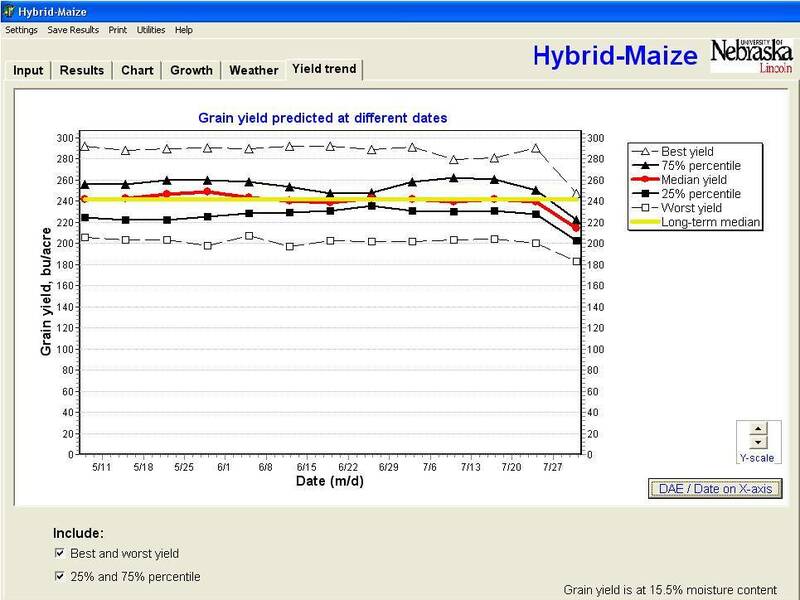 I’m just sharing as several have asked me to and it did such a good job of predicting in-season yields last year. It’s also predicting maturity really early-within the first two weeks of September this year which can affect grain fill and ultimately yield as well. Posted on August 1, 2011, in Crop Updates, Discussion Topics and tagged Agriculture, corn, Predictions, Yield. Bookmark the permalink. Leave a comment.